The metal cans market was valued at USD 46.35 billion in 2017 and is expected to reach a value of USD 56.38 billion by 2023 at a CAGR of 3.32% over the forecast period (2018 - 2023). The scope of the report includes insights on the solutions offered by major players providing the products and services in the can market. The regions included in the report are North America, Europe, Asia-Pacific, Latin America, and Middle East & Africa. The study also emphasizes on various end-user based applications, like food, beverage, and others. Metal cans are one of the most consumed forms of packaging in many industries. Ease of use and high availability has assisted the adoption of metal cans in packaging in the last century. The industry has witnessed numerous innovations since its inception regarding the manufacturing processes, shapes, sizes, and consumption. Preservative properties and higher shelf-life have resulted in the increased deployment of metal cans in food packaging industry, which stands as one of the largest consumer industries for metal cans. Aggressive marketing by beverage companies towards the use of metal cans has also had an impact on the global market, with canned beverages being considered trendy and more difficult to tamper with, while users also consider handling canned food convenient and economical. Increased investments in canned packaging R&D have further propelled the growth of the market. Innovations, such as reduced surface area without affecting the volume, have resulted in lowering the cost of packaging of metal cans, thus, supporting companies in lowering packaging expenses. Consumer trends, such as smaller size consumption and multi-pack consumption, are also supporting the volume growth of the cans in the US and European regions, while similar trends have been observed in the Asia-Pacific region. The growing demand for mini-cans is expected to influence the growth of the market. Due to growing environmental awareness, consumers are demanding metal cans as they have a lower environmental impact. High recyclability of metal is one of the key drivers of the market. The economic conditions and lower pricing of canned goods in some regions remains a key driver in the market. The industry is experiencing high competition from alternative packaging solutions such as plastic and paper. While companies are opting for these solutions due to the lower long-term costs and increased flexibility, the demand from consumers also remains a major factor in the market. Consumers are opting for paper & plastic packaging products that have lower environmental degradation impact in comparison with metal. Plastic remains comparatively cheaper in emerging/developing nations, with users preferring PET bottles over metal cans due to lower costs. Concerns regarding the safety and health relating to the metal cans are also challenging the growth of the market. However, the steady demand and continuous innovations in the industry are supporting the industry. Companies are now focusing on new markets in the industries segments to expand the deployment of metal packaging solutions. Energy drinks and health beverages offer high potential opportunities for the growth of the market. Increasing beverages consumption is expected to increase the usage of metal cans over the forecast period. Overall, the market is expected to grow in the coming years. Environmental and health impacts of the packaging products around the world have resulted in high consumer awareness regarding the packaging materials utilized. High energy consumption of packaging manufacturing is one of the key factors pushing recycling. Diminishing natural reserves, global warming, degradability, and impact of burning & dumping plastics on the environment are the key reasons, along with the economic reasons, that are influencing the consumer demand. Initiatives by environmental groups and exposure to social media have resulted in increasing awareness among the users around the world, with most of the population now being aware of the environmental impact of products used in packaging and are willing to do their part to counter these issues. Consumers are now demanding for packaging products that do not lead to deteriorating the environment or inflict minimum damage. Many users are abandoning plastic usage, while the demand for recycled products is growing. This is creating a high demand for substitute packaging products in the end-user industries. Recyclability of metal is one of the primary factors influencing the consumption of the metal cans in the market. Metal cans are 100% recyclable, with an estimated 30% of the total metal in use being generated from recycling. Recycled metal cans are comparatively cheaper than virgin metal cans. Metal cans have an average 70% collection rate, higher than any other packaging material available in the market. The energy consumed to process recycled metal cans is 5% in comparison to that of manufacturing primary metal cans. 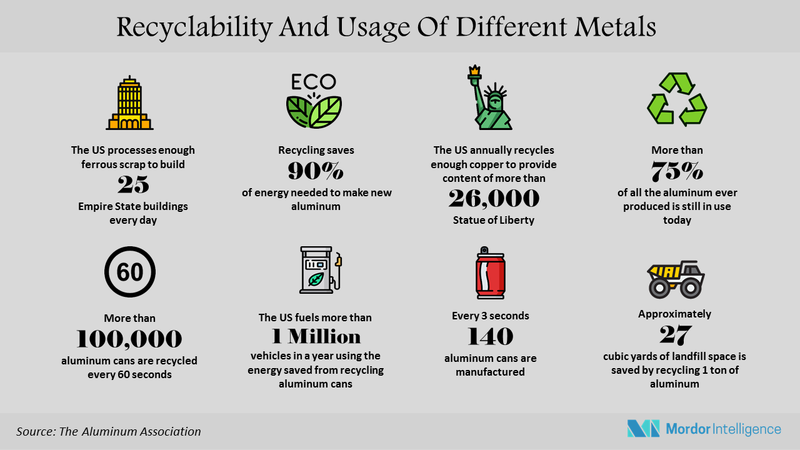 Thus, the industry is making a strong push towards adopting recycling, moreover, government initiatives and consumer support are helping the metal can market. It is estimated that food & beverage can account for more than 40% of the total metal retrieved from dump globally. The governments around the world are pushing industries on environment-related concerns, the establishment of metal recycling plant has grown drastically over the years and is expected to have a positive impact on the overall market. Many companies are utilizing this opportunity, by portraying recycled logo on recycled cans, to attract environmentally conscious consumers and to promote their brand as environment-friendly. Abundant availability of material for recycling is resulting in easier procurement and processing. Companies are taking advantages of recycling in both reducing packaging costs and attracting consumers. The consumption of recycled products is further expected to grow over the coming years, thereby, driving the demand for metal cans. North America has the highest share in the global metal cans market due to a high consumption of metal cans in the United States. Rising concerns over the use and consumption of sustainable packaging materials are expected to drive the demand for market growth over the forecast period. North America has demonstrated a high demand for healthy beverages such as vegetable & fruit juices, iced tea, and cold coffee. The growing demand for the production of sports and health drinks, such as Red Bull, Monster, and Gatorade, is expected to boost the growth of the market. Major beverage giants, Coca-Cola and Pepsi, drive the demand in the US market. These companies have a foothold in almost all the countries around the globe and the measures taken by them are followed by all the businesses in similar industry. Food packaging is also preferred in metal cans. Baby foods, etc., mostly come in metal containers. January 2018 - French beverage retailer Neodif has collaborated with Brasserie Duyck and Crown Bevcan Europe & Middle East to develop new can for Noble Rey beer. January 2018 - Eklo Water, based in Rio de Janeiro, has partnered with Crown Embalagens Metálicas da Amazônia S.A. (Crown Brazil), a subsidiary of Crown Holdings Inc., to introduce the first flavored water to be packed in aluminum beverage cans to the Brazilian market. February 2017 - Crown Asia-Pacific took three awards at the recent Asia CanTech 2016 awards. The company received the Supreme Award and Decorative Award for its 355ml sleek style can it developed for Monster Energy’s Monster Ultra product line. January 2017 - Crown Holdings creative European in-house design team worked alongside Bruichladdich Company to bring simple and stylish tin to life, making use of advanced varnishing, printing, and embossing techniques. Major Players: SKS Bottle & Packaging Inc., Silgan Containers LLC, Ball Corporation, and Crown Holdings Inc., among others. 6.1 SKS Bottle & Packaging Inc.